THE STORY - A sports agent pitches a controversial business opportunity to a rookie basketball player during a lockout. THE GOOD - The dialogue is flawless. Every spoken word packs the force of a punch from Rocky Balboa. Every member of the ensemble is stellar and is given a moment to shine. Soderbergh's ability to remove the curtain of a "film shot on an iPhone" and deliver something truly cinematic is outstanding. THE BAD - Not much. This is a film that gets mostly everything right. ​Steven Soderbergh's basketball drama "High Flying Bird" is the first masterpiece of 2019. An in-depth look at what it means to be an athlete in this digital age and how it's not only about how much time you actually play the game but how you present yourself on social media sites like Twitter. The film is quick-witted and full of heart, tension, and passion. The entire ensemble is outstanding and each member gets a great shining moment to showcase their skills. The script from Tarell Alvin McCraney, the Academy Award-winning screenwriter behind "Moonlight," is full of "Sorkin-esque" like dialogue and is downright immaculate. Soderbergh removes the stigma behind shooting a feature film on an iPhone and creates something that, much like his last iPhone shot film from last year ("Unsane"), feels truly cinematic. 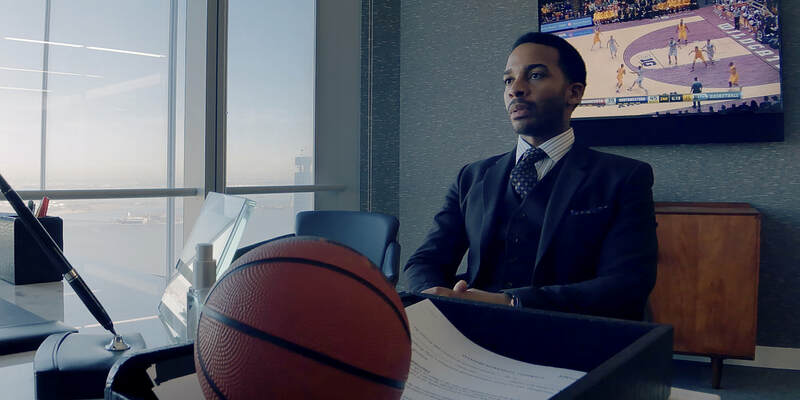 Told through the eyes of basketball agent Ray Burke (Andre Holland) during an NBA lockout one of the players that Burke represents, rookie Erick Scott (Melvin Gregg), begins to become concerned about making money. Scott was drafted into the NBA in 2019 and has yet to play a real game on a real court due to the lockout but it isn't about the money for him, it's about the love of the game. He still needs to live however so he desperately is searching for a way to get a hold of some money. Burke devises a plan that could cause a massive publicity stunt to get Scott into the spotlight, even during the lockout. The opening scene is a knockout and sets the pace as well as the tone for the entire film. It opens with Ray Burke and Erick Scott discussing the lockout over lunch in a rather fancy restaurant. When Burke goes to pay, his company cards are declined just after he finished giving Scott a speech about how if Scott needed money, he should have asked Burke. Burke talks about hope and never losing that love of the game. Even though the league is in the middle of a lockout and players aren't getting paid or even playing, that love for the sport is all that matters and it is what will get them through this drought. The film also features interviews with real NBA players discussing their thoughts on getting drafted and their rookie season which gives the film a different level of depth. Obviously, the drama that arises from the characters in the film and the dialogue they share is one thing, but seeing Minnesota Timberwolves center Karl-Anthony Towns talk to us about how difficult that first year in the NBA is, creates a different kind of vibe. It's not a nostalgic, heart-warming kind of feeling you get from "When Harry Met Sally. Rather, it's a more realistic feeling. A feeling that tells you this film is layered beyond our imagination because it has soared past just a simple sports drama. In terms of filmmaking, "High Flying Bird" is exceptional. The first thing to note once again is the incredible script from Tarell Alvin McCraney. Using his unique voice and set within the world of basketball, McCraney's script is easily the best part of the film. It flows so smoothly between scenes and the dialogue feels genuine and realistic. It feels almost like an incredibly stylized 30 for 30 in the sense that the film knows what it's actually talking about it when it comes to both sports and humanistic drama. There is never once a shift in pace or tone that would allow someone to examine this and say "...these guys don't know what they're talking about." The film is beyond smart. It's sharp and downright brilliant. The next aspect that immediately strikes you is the ensemble. Andre Holland, who is always spectacular, carries the weight of the film in the lead role. He is brilliant as the man who is constantly two steps ahead of every single person in the room. Melvin Gregg is an actor destined for stardom. After showcasing his talents on the Netflix original series "American Vandal," Gregg has moved to the feature film game and things could not be more exciting for this actor. He is beyond extraordinary in his role as the rookie basketball star and he transcends himself so much more than just what is shown on screen. Zazie Beets continues to showcase her stardom as well, keeping every single character she encounters on her toes as she is much more lethal than she leads on. Proving to be the smartest person in the room, every time, no matter who she is going up against, Beets is cutting, quick, and downright deadly. The final aspect that is completely mind-blowing is the use of the iPhone. "High Flying Bird" is only the second film that Steven Soderbergh has shot on an iPhone (the first being "Unsane"), and you can hardly even tell. The scope of this film is massive, much like the NBA itself. Instead of the tight, extreme close up approach, he took with "Unsane," Soderbergh (who once again acts as his own cinematographer) completely flips the script. Huge sweeping shots of buildings and their interiors, massive wide shots that tell us just how big a certain character's ego is. The cinematography from the small Apple device is stunning and a true testament to what can be achieved with the format. The lighting design is exceptional and crisp, echoing a much earlier Soderbergh style. This is a director who is proving that you don't need a massively expensive camera to make your film look and feel cinematic. You can do it with the device that is constantly in your pocket and that is downright inspiring to young filmmakers all around the world. "High Flying Bird" is an exceptional piece of cinema and the first masterpiece to land in 2019. Soderbergh has proven that even after some time away from the medium, he still is as clever as ever and can craft excellent pieces of work using nothing more than the tiny device in your pocket. The film's ensemble is outstanding, the script is next level great, and the cinematography is both stunning and stylistic. "High Flying Bird" is sadly a beginning of the year release that will probably get lost in the shuffle as the year goes on, much like "Unsane" did last year. Hopefully, we can prevent that from happening and continuously hype this film up the entire year because it truly deserves it.